Forty-five years have passed since humans last set foot on an extraterrestrial body. Now, the moon is back at the center of efforts not only to explore space, but to create a permanent, independent space-faring society. Planning expeditions to Earth's nearest celestial neighbor is no longer just a NASA effort, though the U.S. space agency has plans for a moon-orbiting space station that would serve as a staging ground for Mars missions in the early 2030s. The United Launch Alliance, a joint venture between Lockheed Martin and Boeing, is planning a lunar fueling station for spacecraft, capable of supporting 1,000 people living in space within 30 years. Billionaires Elon Musk, Jeff Bezos and Robert Bigelow all have companies aiming to deliver people or goods to the moon. Several teams competing for a share of Google's US$30 million cash prize are planning to launch rovers to the moon. We and 27 other students from around the world recently participated in the 2017 Caltech Space Challenge, proposing designs of what a lunar launch and supply station for deep space missions might look like, and how it would work. Right now all space missions are based on, and launched from, Earth. But Earth's gravitational pull is strong. To get into orbit, a rocket has to be traveling 11 kilometers a second – 25,000 miles per hour! Any rocket leaving Earth has to carry all the fuel it will ever use to get to its destination and, if needed, back again. That fuel is heavy – and getting it moving at such high speeds takes a lot of energy. If we could refuel in orbit, that launch energy could lift more people or cargo or scientific equipment into orbit. Then the spacecraft could refuel in space, where Earth's gravity is less powerful. The moon has one-sixth the gravity of Earth, which makes it an attractive alternative base. The moon also has ice, which we already know how to process into a hydrogen-oxygen propellant that we use in many modern rockets. NASA's Lunar Reconnaissance Orbiter and Lunar Crater Observation and Sensing Satellite missions have already found substantial amounts of ice in permanently shadowed craters on the moon. Those locations would be tricky to mine because they are colder and offer no sunlight to power roving vehicles. However, we could install big mirrors on the craters' rims to illuminate solar panels in the permanently shadowed regions. 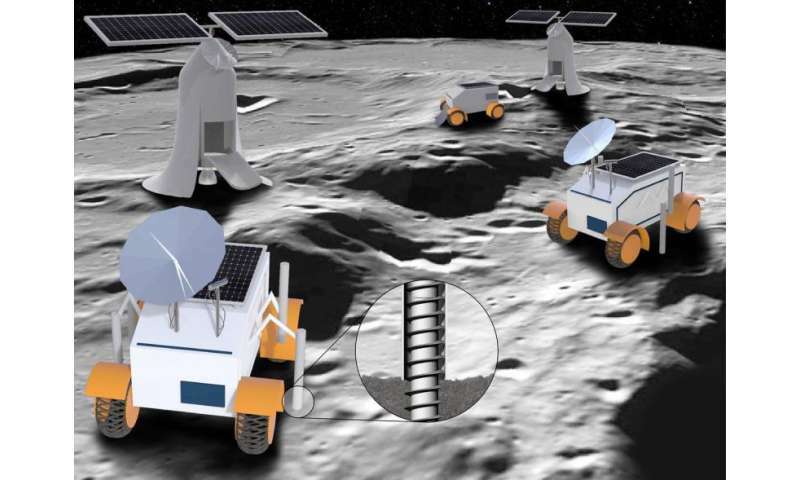 Rovers from Google's Lunar X Prize competition and NASA's Lunar Resource Prospector, set to launch in 2020, would also contribute to finding good locations to mine ice. Depending on where the best ice reserves are, we might need to build several small robotic moon bases. Each one would mine ice, manufacture liquid propellant and transfer it to passing spacecraft. Our team developed plans to accomplish those tasks with three different types of rovers. 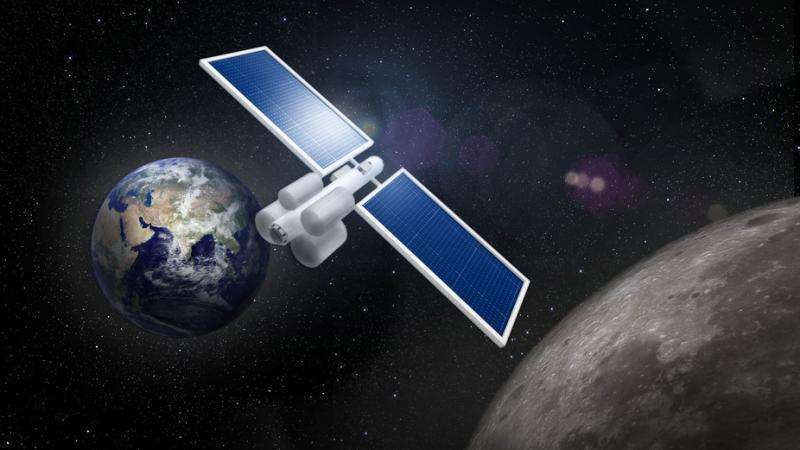 Our plans also require a few small robotic shuttles to meet up with nearby deep-space mission vehicles in lunar orbit. One rover, which we call the Prospector, would explore the moon and find ice-bearing locations. A second rover, the Constructor, would follow along behind, building a launch pad and packing down roadways to ease movements for the third rover type, the Miners, which actually collect the ice and deliver it to nearby storage tanks and an electrolysis processing plant that splits water into hydrogen and oxygen. The Constructor would also build a landing pad where the small near-moon transport spacecraft we call Lunar Resupply Shuttles would arrive to collect fuel for delivery as newly launched spacecraft pass by the moon. The shuttles would burn moon-made fuel and would have advanced guidance and navigation systems to travel between lunar bases and their target spacecraft. When enough fuel is being produced, and the shuttle delivery system is tested and reliable, our plan calls for building a gas station in space. The shuttles would deliver ice directly to the orbiting fuel depot, where it would be processed into fuel and where rockets heading to Mars or elsewhere could dock to top up. The depot would have large solar arrays powering an electrolysis module for melting the ice and then turning the water into fuel, and large fuel tanks to store what's made. NASA is already working on most of the technology needed for a depot like this, including docking and fuel transfer. We anticipate a working depot could be ready in the early 2030s, just in time for the first human missions to Mars. To be most useful and efficient, the depot should be located in a stable orbit relatively near both the Earth and the moon. The Earth-moon Lagrangian Point 1 (L1) is a point in space about 85 percent of the way from Earth to the moon, where the force of Earth's gravity would exactly equal the force of the moon's gravity pulling in the other direction. It's the perfect pit stop for a spacecraft on its way to Mars or the outer planets. Our team also found a fuel-efficient way to get spacecraft from Earth orbit to the depot at L1, requiring even less launch fuel and freeing up more lift energy for cargo items. First, the spacecraft would launch from Earth into Low Earth Orbit with an empty propellant tank. Then, the spacecraft and its cargo could be towed from Low Earth Orbit to the depot at L1 using a solar electric propulsion tug, a spacecraft largely propelled by solar-powered electric thrusters. This would let us triple the payload delivery to Mars. At present, a human Mars mission is estimated to cost as much as US$100 billion, and will need hundreds of tons of cargo. Delivering more cargo from Earth to Mars with fewer rocket launches would save billions of dollars and years of time. Building a gas station between Earth and the moon would also reduce costs for missions beyond Mars. NASA is looking for extraterrestrial life on the moons of Saturn and Jupiter. Future spacecraft could carry much more cargo if they could refuel in space – who knows what scientific discoveries sending large exploration vehicles to these moons could enable? By helping us escape both Earth's gravity and dependence on its resources, a lunar gas station could be the first small step toward the giant leap into making humanity an interplanetary civilization. This subject has been beat to death for so many years that it seems like just something to pass the time on a slow news day. It's a concept still has so many unknowns that it might as well be called science fiction. That's what a whole lot of this Moon and Mars talk is. We don't know enough about the Moon to know if producing fuel is even feasible, let alone necessary. The whole gimmick of sending people to Mars defies rational thought because of it being so pointless and a huge waste of resources. Yet people are acting like it has to happen. You can find science fiction stories and Popular Science articles from back in the nineteen-fifties about building Moon bases before the year 2000 that could be republished with new drawings and still seem just as plausible. Any technology that might work on the Moon or Mars needs to be proven on the Earth first. Fix the problems on the Earth first and then use the knowledge to colonize the moon if we must. Not really thrilled at making rocket fuel out of water on the moon. That seems like one of those things that will turn out to be a major waste of extremely precious resources in case we do want to go for a moon habitat in some form in the future. If we want to get fuel into orbit to a 'gas station' manufacture it here and use a railgun. I cant even believe that this is being considered. Are we really such morons as to not understand that you don't want to change the gravitational mass of the object that allows life to happen on this planet? You don't mine the Moon for fuel. It is imperative that anyone who reads this understands: We can NOT change the gravitational mass of the Moon in ANY WAY. If this is done, it will be one of the biggest scientific blunders of all time, and possibly with globally catastrophic results. We have totally messed up the Earth, so lets roll up our sleeves, and start messing with the Moon. Brilliant. How can smart people be so stupid? After the Mars Rover landed many years ago I saw a presentation by one of the engineers that worked on the project. The question "Will man ever set foot on Mars was asked" His reply was NO. Mars and Earth are in opposite orbits - clockwise and counterclockwise. The rocket that carried Rover was launched to take advantage of the two planets travelling towards each other. This provided the shortest travel time from Earth - about two years. After that date, the planets are again moving away from each other. If a team reached Mars after a two year flight, and stayed two weeks, they would then need another two plus years of oxygen, food and fuel. Outer space vacuum spinning planets gravity orbiting solar systems do not exist. The sun moon and stars are electro magnetic lights that circle above flat motionless earth. The fake space programs are a big financial scam. Don't be fooled by CGI animation photoshop and jibber jabber mumbo jumbo jive talk. poolerl72 - Moon has so much mass that any mining is utterly irrelevant and wont affect its orbit at all. I suggest you stop calling people stupid when your mental faculties are insufficient to even realize this basic fact. As for the article, propellant depots and making fuel (or at least oxidizer) in situ is crucial for any sustainable colony. However I agree with snerdguy that this is a technology that should be mastered on Earth first. This is something NASA should do, pushing technological boundaries instead of wasting billions on SLS.. There are other potential fuels beyond ice that are also being explored, e.g. He3. Poolerl72, believing that we could possibly alter the mass of the moon appreciably enough to change its orbit sufficiently to have a measureable effect on earth is ridiculous. Generally speaking, ignorance breeds alarmist's views such as these and only serves to feed baseless conspiracy theories. TR3, more ignorance being spouted off. Fuel use is not constant for the approx. 150-300 earth day one-way flight. Fuel is typically used only for launch, land and small corrections in between. Also, O2 for the trip is typically reclaimed as well as possible, but the Sabatier reaction (or other potentials being explored) may be a viable option too if fuel cells continue to be used. Water, radiation and the challenges of deceleration and landing are bigger obstacles to a Mars trip. snerdguy - "Fix the problems on the Earth first and then use the knowledge to colonize the moon if we must." Why are the two items diametrically opposed? We can't possibly fix problems here while exploring the solar system? Is NASA destined to fix earth-bound problems? poolerl72 - "Are we really such morons as to not understand that you don't want to change the gravitational mass of the object that allows life to happen on this planet?" The gravitational mass of our Moon isn't a constant anyway, did you think it was? Look up "accretion". TR3 - "Mars and Earth are in opposite orbits - clockwise and counterclockwise." Yes - orbital mechanics is a thing that exists, surprised? Of all the things we don't know about our solar system, this one is pretty much under control. Shh, go back to youtube and infowars. So it is not a good idea to save water for consumption and use nuclear power for propulsion? It's more efficient to simply derive your propellant producing depot from existing cryotank technology. The SLS EUS, for instance, could store up to 125 tonnes of LOX/LH2 propellant and could be deployed to EML1 with a single SLS launch. Retaining its RL-10 engines would also allow the depot to be redeployed to Mars orbit. So no xenon fueled transfer vehicles would be required. The solar array should be configured so that it can also act as a— sunshield— for the cryotanks, minimizing the energy required to reliquefy ullage gases. Water would also be necessary for a crewed interplanetary vehicle to provide air (oxygen), water for drinking and food preparation, and, of course, water for shielding against heavy nuclei and major solar events. Less propellant would be required for an interplanetary mission if the water shielding could be dumped just before the final trajectory burns to enter orbit, replenishing it at another water depot already in Mars orbit. TR3 - All planets (and Pluto too!) and the vast bulk of other objects orbit the Sun in the same direction. As antialias_physorg notes, maybe it doesn't make sense to squander the Moon's ices on rocket fuel. Maybe the ices should be saved for use on the Moon or launches from there? Lunar railguns would probably work great for getting cargo (and even fuel) off of the Moon without "wasting" fuel. An alternative would be to very, very carefully nudge an icy asteroid or comet fragment into the desired orbit and mine it for fuel, water and metals. This feels like the best long term solution. Quite possibly a record - earned my ignore list with the fewest words yet. I apologize for calling people morons. It just escapes me how we can think taking material away from an orbiting body which causes the tides can seem like no big deal to scientific minded people. The Moon is already receding from us at the rate of about 2 inches a year. Not a big deal at the moment, but this wont remain constant. As it slips out of Earth's gravitational grasp, that trend will rise until it is completely free of us. Yes, this will take a long time. However, if we are removing material from the moon, we change its mass. It's a bad idea. We could influence the rate of departure, OR cause the Earth to pull on the Moon harder, and bring it on an unintended collision with us. Yes, mass changes and I know what accretion is. At least I do now. I looked it up. It does not excuse the intentional disruption of a celestial body for the sake of fuel. Im sorry but this idea is kind of ridiculous. The primary consumers of a propellant depot at EML-1 would be SpaceX and Blue Origin. By the time an EML- Depot was online, those two rocket companies will only use methane engines. I applaud the effort, but unless you demonstrate a cheap way to make methane from Lunar resources, all is for naught. Lock-Mart/Boeing/ULA will NEVER build a depot without 100% funding from US Government, and that will not happen. Blue Origin has stated is main purpose is to develop off-world, space infrastructure. They will need a lot of Methane, and so will SpaceX plans for Mars colonization. @poolerl72, you could remove a billion tons of mass from the moon and it would change it's mass by about one trillionth of a percent. We could influence the rate of departure, OR cause the Earth to pull on the Moon harder, and bring it on an unintended collision with us. Erm...no and..no. You desparately need to get a feeling for orders of magnitude. Maybe we just don't deserve it. Let's just go with his line of reasoning. We'll be launching tons of spaceships and cargo off of the Earth, so we need to lighten the moon to keep us both at the same relative mass. There, problem solved! 1/2 dozen modern versions of a Saturn V + NERVA = the best way to Mars. An Isp of 1500 is sufficient. Its the only drive mechanism that makes sense.